Do you dream of having an herb garden, but live in a small apartment with no garden? 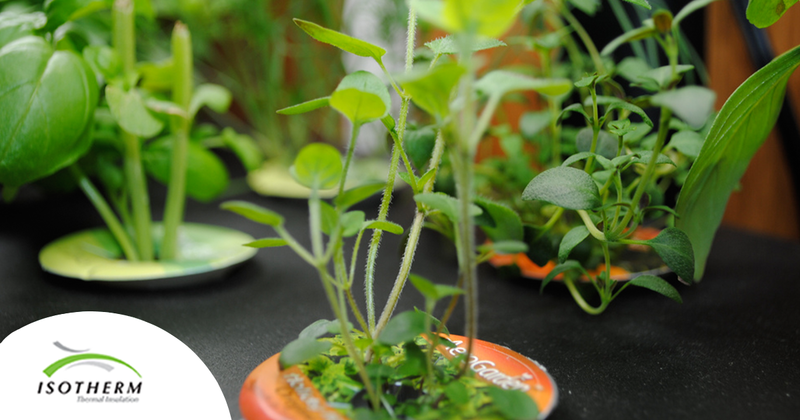 Never fear, we have some great tips on how you can start a flourishing indoor herb garden. All you need is windowsill or a sunny spot. 18 hours of light is ideal, but only 8 of those need to be direct sunlight. If you don’t have a window that allows enough natural light in, you can use bright artificial lighting. Two or three fluorescent bulbs above the plant will do the trick. Natural light will vary according to the weather and the season, so installing artificial lights will help on darker days. Make sure the light bulbs give a warm (yellow) light and not a cold (blue) light. A small metal halide light is also a good choice of lighting, as it provides strong, bright light over a large area. Some herbs grow better in poorer soil, as they can develop a stronger flavour. In very rich soil, the leaves and stem may grow faster and so don’t produce the essential oils that give them their flavour. Read the package instructions or ask your garden centre which soils your particular herb will grow best in. You can choose to plant your herbs as seeds, or buy small bulbs or sprouts to transplant into your home garden. We definitely recommend transplanting herbs instead of growing from seeds, as it is much less time-consuming and guarantees that the plants are healthy from the start. Find adequately sized pots or containers that offer good drainage. If your pot does not have drainage holes underneath, your herbs will be sitting in stagnant water and can rot or die. Remember that the water has to go somewhere once it leaves the pot, and will ruin the surface the pot is resting on. Use a liner, drainage pan or saucer underneath the pot, and empty it when it becomes full. A clay saucer lets moisture pass through, so choose plastic, rubber, or metal instead. Clay pots are great for drainage, but they can dry out quickly. If you live in a dry part of South Africa or use a heaters a lot (especially in winter when the air is drier), use a glazed or plastic container instead of clay. When the surface of the soil feels dry, it is time to water your herbs. Quick drainage is ideal, and it is best to water thoroughly but less often. Water the pot until the first drops reach the drainage pan or saucer. Make sure the water is reaching the soil and not collecting on the leaves of the herbs. After about ten days of growth, you can start feeding your herbs. You can buy plant food at local florists and garden centres, and even some grocery stores. The food consists of vitamins and growth hormones, and helps the plant grow healthily. Potted herbs will eventually use up all the nutrients in the soil, so you will need to feed and fertilise regularly. Plant food is essentially a type of fertiliser, but regular fertiliser for the soil is helpful. The ideal fertiliser and amount will depend on your plant as well as your soil, but this a good guide: Use a soil mix with just enough nutrients to keep the initial growth controlled. Mix 2 parts coir (coconut fibre) compost to 1 part perlite, and add 20% worm castings. Test the pH of any mix, and if it is acidic, add one gram of hydrated lime for every litre of soil mix. Alternatively, you can substitute with vermiculite, which does not need pH adjusting. Finally, add 3 to 4 tablespoons of kelp meal for each litre of soil to add plant hormones and to give beneficial micro-organisms something to feed on. Remember that your herbs are going to be eaten, so be sure not to use chemical fertilisers or pesticides that are harmful when ingested. Once the plant has enough leaves, you can begin cutting off some leaves to use in your cooking. This is usually once the herbs are about 4 to 6 weeks old. Make sure you don’t cut off too many at once or your plant will die. Enjoy delicious, fresh herbs in your salads and cooking – direct from your own herb garden!